Forward CloudWatch alarms to Slack. Acknowledge, Pass, or Close alerts. Working as DevOps engineers in various teams we have alway been looking for a tool to share on-call duty among many shoulders without the need for organizational overhead. We came up with the idea of building a chatbot to combine Amazon CloudWatch with Slack. Avoid alert fatigue! Connect Amazon CloudWatch and Slack to spread alerts among your team members. One engineer, not the whole team, receives an alert. You can focus on your project work instead of being distracted by your pager. marbot escalates unnoticed incidents up to the next engineer or the team. No need to register a new account or install a new app. 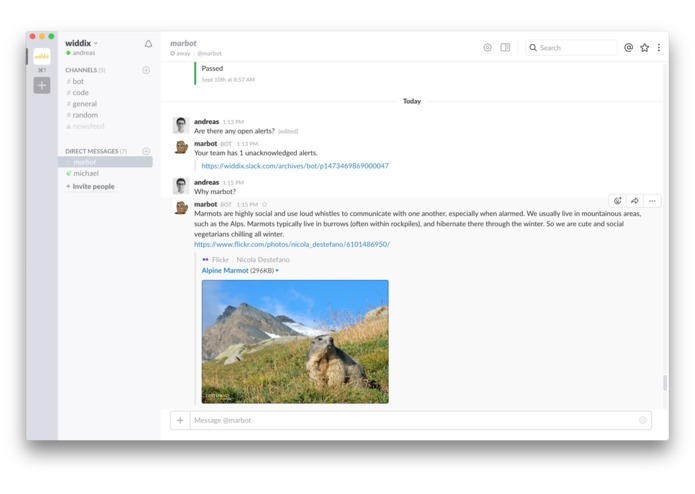 Just reuse your favorite messaging app: Slack. marbot delivers alarms by sending direct messages. Acknowledging, passing, and closing alerts with Slack-native actions. No need to setup complicated on-call rotations and schedules. 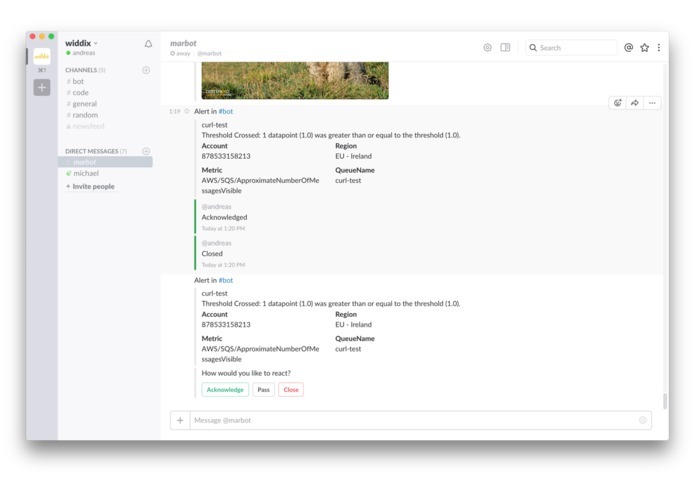 Use Slack channels to organize teams. Join a channel to be on-call. marbot respects your DND schedule and snooze setting. 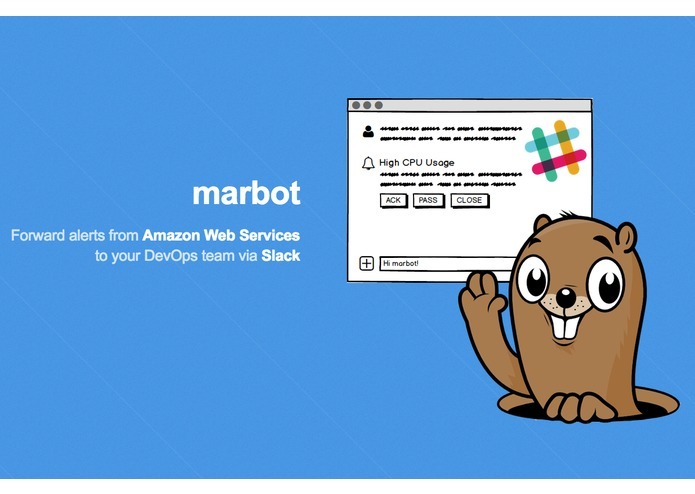 We used the following services and tools to create marbot. Besides building a great chatbot our goal during this hackathon was to learn about new services and tools. Getting started with new tools and services has been a rewarding challenge for us. Using the latest version of the Serverless framework to deploy our chatbot. Analyzing data with Amazon Kinesis Analytics. Talking to the Slack APIs. We were particularly proud of the following three details of our chatbot. marbot is simple to use. It combines existing concepts to provide a relaxed pager solution. We spent a lot of effort to simplify the onboarding process and day-to-day usage. marbot was approved by Slack and is listed in the Slack App Directory. marbot is making use of a shiny new service: Amazon Kinesis Analytics. Allowing us to generate accurate daily team statistics. People do love our sweet marmot mascot. Using the Serverless framework to speed up the setup process of a serverless environment. How to analyze data streams with Kinesis Analytics. We are looking forward to improving our Minimum Viable Product based on the feedback from our steadily growing user base. I worked on the Slack integration (Events API, Oauth, Button), SNS integration and NLP. I worked on the timer triggering an escalation of alerts. I've also implemented the daily team statistics based on Kinesis Analytics.